Another weekend to celebrate after a week of stressful workloads & paper files to finish. Nothing beats a good dinner on a friday night to end up a week. 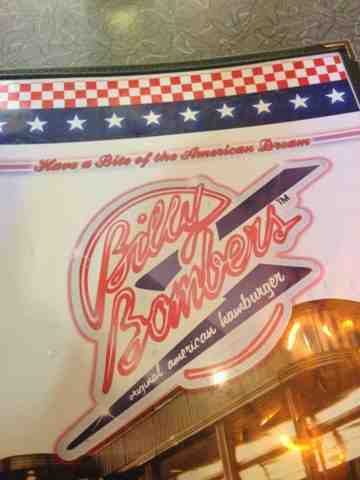 Have a bite of the American Dream at Billy Bombers! I had the chance to meet up with my beloved friends in Cathay at Dhoby Ghaut area to spend some catch up moments. We were all craving for some food indulgence that went down to be a cheat day. Catching up with good old time friend is best done in such places like Breeks Cafe that offers not only quality food selections that will satisfy any sorts of cravings that you have, but also gives a quality service & accommodating ambience for hungry goers. We had only desserts with my food-trip friend Cherry so I will definitely come back for more. The dessert selections was quite surprising in terms of value for money price offer. Fashion today is an expression of individuality, the age where freedom in fashion gave folks the opportunity to express unique style and break away from the stiff raider uniforms of the 1900's. Now is the time for "anything goes" attitude that made the world a much livelier & vivid place to live in. Evoking the individualistic spirit of the era with this bright statement shirt from WearHisWord brand for a modern design detail. 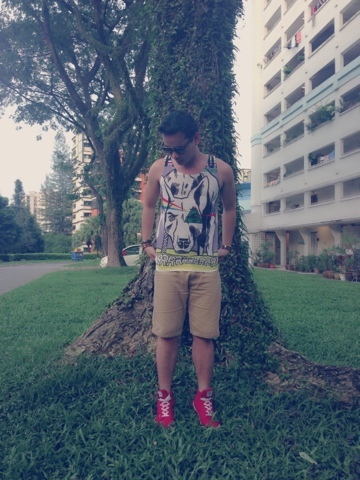 I usually prefer matching cool shirt with a shorts & good old-time sneakers for a laidback look. Adding some accesories to totally complete the style is where the magic begins. After all, isn't fashion about expressing yourself? It is nice to be back at Gardens by the Bay where nature meets the city life. 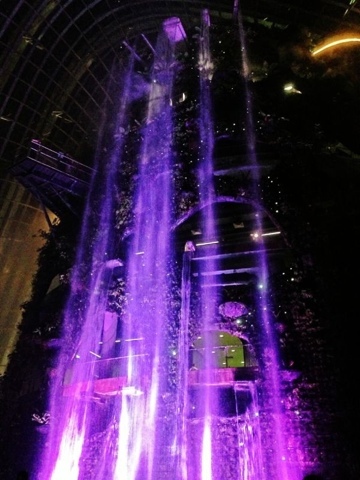 Refresh yourself in the mist of the waterfall just as the plants in our Cloud Forest do! High in tropical mountains, these plants would absorb the abundant rainfall, releasing the water gradually to create a constant, long-lasting supply for the land beneath them – supporting even more plants! Our mountain has been densely planted with a mixture of fascinating orchids, delicate ferns, colourful bromeliads, dazzling begonias and menacing carnivorous pitcher plants. All of these are epiphytic and live on top of other plants in nature, requiring little substrate and are perfectly adapted for growing on vertical walls. Stop by the Black Box and learn about self-sustainability at Gardens by the Bay. Discover the numerous ecological functions of our Supertrees like capturing solar energy and serving as exhausts all while supporting a green living skin. Find out how Singapore’s parks and gardens provide discarded plant matter as fuel for a biomass furnace that provides energy to cool the air in both conservatories. I have been fascinated with oceanarium since I was a kid. We have Ocean World in the Philippines but I never experience it back then. To experience Underwater World Singapore for the first time in my life, was a thrilling memories esp. that I went there with my co-kid at heart friends that made it a truly memorable day. So I'm sharing with you my unforgettable experience with the aquatic creatures only at Underwater World Singapore. Hope it will open your imagination & awareness on how the world was amazingly created & be environmental- friendly to save these precious animals from extinction for future generations to enjoy! Underwater World (Chinese: 新加坡海底世界), also known as Underwater World Singapore Pte Ltd, is an oceanarium located on the offshore Singaporean island of Sentosa. 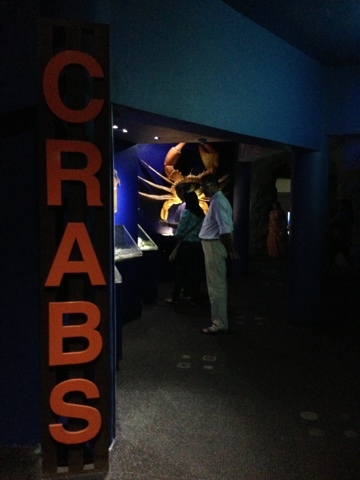 Opened in 1991, it has more than 2,500 marine animals of 250 species from different regions of the world. The oceanarium is mostly underground and it is owned by the Haw Par Corporation. The Underwater World's ticket includes admission to the Dolphin Lagoon at Palawan Beach. Underwater World is also involved in several environmental and educational projects, such as the Living in the Ocean Programme, Ocean Ambassador Programme and the Coral Club. The Underwater World also provides exclusive venues to host events, such as ocean-themed functions. Welcome to Singapore's sole attraction offering a one-and-only experience with pink dolphins, where spectacular performances starring the dolphins and fur seals will capture the hearts and minds of audiences young and old. Feast your eyes on the graceful moves and fascinating behaviors of our marine friends, as you embark on the adventure of a lifetime in an underwater sanctuary where learning comes alive. As an intimate, family-friendly oceanarium packed with interactive encounters, we take visitors on an enchanting voyage right into the ocean's depths. Engage with majestic sharks and rays, exotic Sea Dragons, ethereal Sea Angels and living fossils like the Arapaima for a kaleidoscope of oceanic perspectives. On top of stirring the imagination, our educational exhibits and programmes inspire the public to share our commitment in conserving our beautiful but fragile marine world. Rates include single admission to Underwater World Singapore and Dolphin Lagoon. You can board a cable car from Mount Faber or Cable Car Towers at HarbourFront Centre from 8.30am-9pm daily. Alight at Harboufront MRT Station and walk to VivoCity Shopping Mall's waterfront promenade. Take a stroll down Sentosa Boardwalk, the only garden-themed boardwalk in South East Asia, featuring five tropical landscapes that are indigenous to Singapore. Boardwalk is open 24 hours daily. Sentosa admission is separately payable at the Sentosa Visitor Arrival Centre at the end of Sentosa Boardwalk. Alight at HarbourFront MRT station and take the Sentosa Express from Sentosa Station located at VivoCity Level 3. Sentosa admission tickets and Sentosa Express fares can be purchased at the Sentosa Station Ticketing Counter. Taxis could bring you directly into Sentosa – Underwater World Singapore. Please inform the taxi driver to drive towards the direction of Shangri-La Rasa Sentosa Resort. Underwater World Singapore is located just next to it. Note: Island admission is charged by per Taxi entry. A flat gantry charge is applicable to each vehicle entering Sentosa. Charges varies according to time period. The feeding sessions are definitely a must-see! It is particularly interesting to see how the various species actually feed. Viewers will also notice that many of the inhabitants at Underwater World Singapore have developed quite interesting relationships with the divers who hand-feed them! Share your unforgettable experiences at Underwater World Singapore with your family and friends by bringing back sweet mementos from our specialised gift shop. At Underwater World Singapore's Souvenir House, you will would be able to find lovely gifts to suit all ages and tastes, ranging from sea animals backpacks, mugs, exclusively designed T-shirts, huggable soft toys to educational marine life guides. The Boxing Crab is a new and unique seafood restaurant concept by lifestyle food service company, Food Junction Holdings Limited. Featuring an eclectic mix of seafood caught both locally as well as flown-in fresh from all over the globe, diners can choose to have their meals cooked in a variety of styles including Indonesian, Western, and Singaporean. Adjacent to the Underwater World Singapore at Sentosa, The Boxing Crab offers diners a VIP room with its own private balcony. There will also be sheltered and unsheltered outdoor seating with a sea-facing view. Before dinner, take a stroll along the beach in the early evening to catch a glimpse of the sun setting behind the landscapes, where you will be mesmerized by the serenity view. The Hot Dog King kiosk is located just behind the bus stop in front of Underwater World Singapore. The perfect snack for lovers of hot dogs. Even for those of you who are not hungry yet, you probably would be tempted to try one of these. Tantalise your taste buds with the selections of hot dogs & burgers now. The Cool Stop offers visitors to Underwater World Singapore various types of finger food as well as a good variety of local desserts like the Ice Kacang (local dessert made with crushed ice covered with colorful syrups and includes condiments of red beans and jellies), which will be a great refreshing way to spend a sunny day on Sentosa. Take a welcome break from exploring the sights and sounds of the oceanarium with mouth-watering nibbles and a well-deserved cuppa. It is grab and go! Drink to your heart's content with a fantastic choice of flavorful drinks that will leave you smacking lips. Refresh yourself and keep yourself hydrated on the sunny island of Singapore! Be enchanted by stunning views of the entire Dolphin Lagoon while savoring delightful pastries with your favorite cuppa. From the elevated air-conditioned VIP gallery, enjoy great views of the crystal clear waters of the dolphin performance arena! The Dolphin Suite is also the perfect backdrop for intimate corporate or private events of up to 70 guests. You can email at uwspl@underwaterworld.com.sg for your event enquiries. Since it's summer I've been looking for muscle tees around for my summer needs. I bumped into this online shop Ermahgerd that showcases the best design summer tops a little like Givenchy inspired collection. 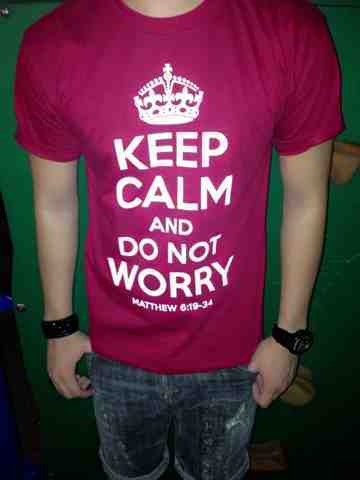 I purchased one of this design I'm wearing now that really captivated my attention. I liked the animal inspired colorful print that matches any jeans or shorts by simply playing with its colors. Lastly, since it's summer time, we can never go out without having a nice sunnies as protection from the mighty sun. 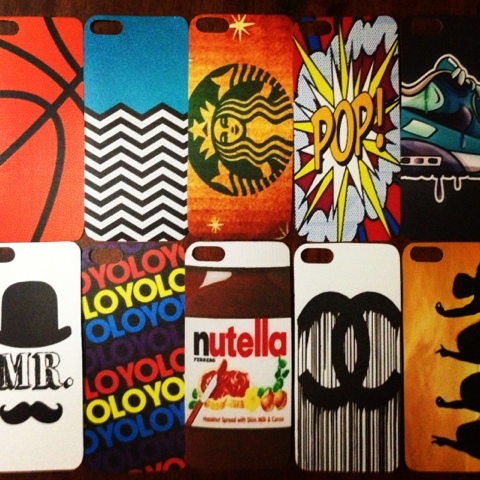 Recently, Instagram has been a mini- online shopping site where you can purchase any item directly from its sellers. I got several awesome sunglasses from @vogueshoppe that sells 1st class & hard to find sunnies designs. The one I'm wearing here named Super Giaguaro Black really complements my facial structure & looks pretty amazing. The House of Robert Timms is an exclusive Australian brand that is establishing its presence in Singapore as a provider of gourmet coffee. My spirit was sweetened when I first tried enjoying this place for a quick coffee fix while strolling around Orchard Road. The second time I went to this place with my dear friend Jeanna went totally impressive as I tried on their wide varieties of desserts including delish Choc Brownie Stack with Ice-Cream & New York Cheesecake. 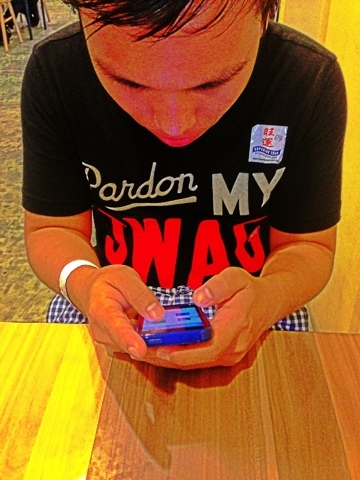 So I never hesitated to come back for a third time to catch up with my lovely friends Lucky & Cherry. This time I had a delightful satisfaction of their Red Velvet Cupcake with Cream Cheese & Choco Hazelnut Cupcake. As for their coffee drink choices, you can never go wrong with their Robert Timms original signature coffee frappe. As I dig in more with their menus, I was stunned that they actually specializes more into delightful encounter with kangaroo meat and boozy alcoholic sweets as well! How about that? 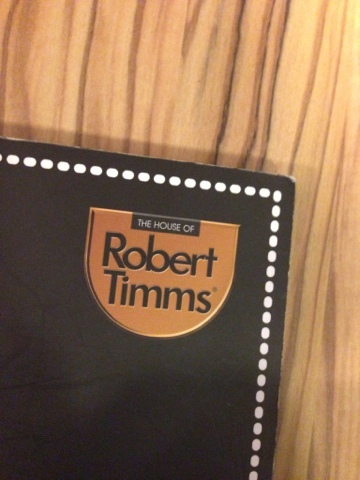 Even if I haven't tried this yet, I'm pretty sure everyone who goes for a visit at The House of Robert Timms will delightfully enjoy the whole ambience & the food/ dessert selection as well. You can visit their Facebook official website (here) for the latest update on their menu selection & lovely occasion offers. So what are you waiting for, bring the whole family or friends in these wonderful place to indulge your tummies with good food & a sinful note of desserts. Unleashing the kid part of us. For those who think Legoland was built for children alone, well one must visit this theme park & you'll realize its for big boys like us too, even better! All angles of this happy land are full of colors, lego bricks, fun & smile for everyone. I've been planning for so long to visit this place since it was opened last year, finally those plans came to life. Thanks to my frequent SG visitor Mark who came with me on this awesome adventure to Legoland. Such a lifetime & memorable experience. We've tried Project X for countless times since this ride made us the most thrilling effect. Same with other roller coaster rides but not that exciting since it's made for kiddos most likely. What I admire the most is the Miniland part. It's like your having a grand tour of Asia where everything was made out of Lego bricks in a majestic & amazing ways. It took me sometime to digest all the iconic places & historical landmark of various countries the theme park portrayed. You will might as well try the infamous water rides that we weren't able to experience coz we didn't bring in extra clothes. All in all I could say my trip to Legoland reached my expectation or even beyond it. So book your tickets now & experience the best of Legoland. LEGOLAND Malaysia is packed full of family fun with more than 40 rides, shows and attractions. Almost everything is hands-on, so you can push, pedal and program, or steer, squirt and splash, your way through a truly interactive experience – and of course there’s building too. LEGOLAND Malaysia has seven themed areas of attractions for all ages such as The Beginning, LEGO® Technic, LEGO Kingdoms, Imagination, LEGO City, Land of Adventure and MINILAND. It’s an inspirational land where the children are the heroes. From LEGO experiment centres to rollercoasters, the park is a day-long voyage of discovery for all the family. The centrepiece is MINILAND, where Asian landmarks have been recreated using more than 30 million LEGO bricks. It’s an interactive world on a scale of 1:20, where people, trains and aeroplanes come to life at the touch of a button. Which child does not dream of becoming a knight, an explorer, a test driver or a pilot and entering into a fascinating world of adventure? At LEGOLAND® Malaysia, children can slip into the roles of their heroes and do things that normally only the grown-ups are allowed to do – like taking their first driving test, competing in a jousting tournament, jetskiing across the water at breakneck speed, or designing and programming LEGO® robots. It takes twelve hours just to ride on all the LEGOLAND attractions, watch all the shows and 4D films and take part in all the workshops – and that is just the actual ride and performance time. LEGOLAND Malaysia, which opened to the public on 15th September 2012, is the sixth LEGOLAND to be built in the world and the very first in Asia. Designed for families with children between the ages of 2 and 12, LEGOLAND Malaysia features more than 40 interactive rides, shows and attractions. LEGOLAND Parks are based on the universally popular LEGO building toy and offer families the opportunity to push the boundaries of their imaginations and creativity, and have fun while learning, all while enjoying hands-on, interactive experiences. Families are immersed in a unique mix of child powered rides, building challenges, spectacular LEGO models, family-friendly coasters and shows that pull the audience into the action. Other LEGOLAND theme parks across the world are situated in Denmark, the United Kingdom, Germany and the USA (California and Florida). There are LEGOLAND Hotels in the Parks in Denmark and the UK; with a hotel scheduled to open in California in 2013. LEGOLAND Malaysia family theme park is owned by Themed Attractions and Resorts Sdn Bhd (TAR), Iskandar Investment Berhad (IIB) and Merlin Entertainments Group. The Park is operated by Merlin Entertainments, the world’s second largest visitor attraction operator. LEGOLAND® Malaysia is open most of the day in 2013 from 10 am until 6 pm. Longer opening hours apply on weekends, during school and public holidays. Attraction queue lines will close at posted park closing time. LEGOLAND Express, Dino Island, and Pharoah’s Revenge will close at sunset due to safety (darkness). Please plan your day accordingly to enjoy all of our attractions. Restaurant and shop hours may vary due to visitor appearance. Starting from 1st February 2013 onwards, there will be parking charges within LEGOLAND® Malaysia vicinity. Zone 3 parking – Hourly *Will be closed from 2nd May 2013 onwards for upgrade. LEGOLAND® Malaysia is a family theme park designed for families with children ages 2 to 12 years old and contains more than 40 interactive rides, shows and attractions. The first LEGOLAND Park in Asia is strategically located at the heart of the Iskandar region with easy access from anywhere in Johor. The Iskandar Coastal Highway provides great accessibility for traveller’s and connects the centre of Johor to LEGOLAND Malaysia in just under 10 minutes. And since the family theme park spans 76-acres and loaded with a whole day of fun, we know you couldn’t possibly want to leave without having tried them all! Our official Hotel Partners arrange value-for-money overnight packages, so be sure to check on-going promotions when planning your trip. - Take Tuas / Nusajaya / Pontian / Tanjung Pelepas EXIT 253 > Proceed to Nusajaya EXIT 312 > LEGOLAND® Malaysia signage will lead you to the destination! Awesome April for me. I've been so blessed in all aspects of my life & so I'm thankful for that. I noticed as well that I overspent on food tripping & shopping episodes so you'll notice it all in this month photo diary of mine. When I went back to Philippines two months ago, I finally had a taste of the refreshing smoothies at Jamba Juice. They offered classic, all-fruit & creamy smoothies. Have a try of their protein berry workout & strawberries wild. It's made up of whole fruits & juices with nonfat frozen yogurt & sherbet. They also have steel cut oatmeal, yogurt & fruit parfait, fresh squeezed juice & california flatbreads and wraps. With every order of a smoothie, get a complimentary boost on them. Choose from Energy, Immunity, Daily Vitamin or Soy Protein. 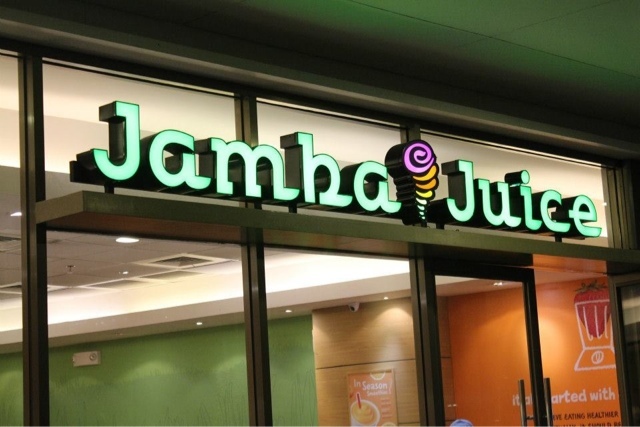 So for all health buffs out there, Jamba juice is the ultimate place for you to have the refreshing smoothies & juices in a healthy way to maintain an active lifestyle while enjoying life through good food options. Enjoy these photos everyone.